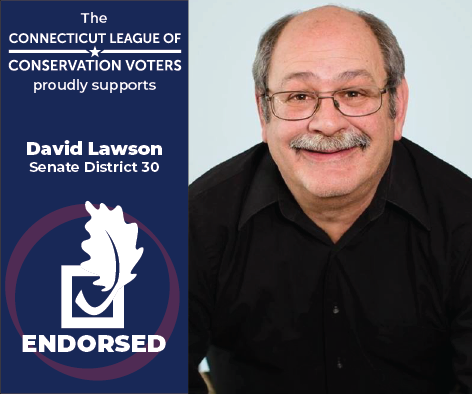 The Connecticut League of Conservation Voters (CTLCV)—a bipartisan organization dedicated to protecting our environment by making it a priority for our elected leaders—endorsed David Lawson (D) to represent the 30th Senate District. Lawson is the current Chair of the New Milford Board of Education, and has worked closely with local land trusts and other groups to preserve open space. His commitment to clean water and air stands in sharp contrast to his opponent, Sen. Craig Miner, who actively worked to weaken environmental protections and used his position as Chair of the Environment Committee to block key bills from even being considered. Miner has an abysmal 54% Lifetime Score in CTLCV’s 2018 Environmental Scorecard, a clear indication that he does not prioritize the environment or public health. Craig Miner's lifetime of voting against the environment and for big polluters has landed him on CTLCV's Dirty Dozen in the States.